EJOT self-drilling screws connect components in one work step: they drill, form the thread and fasten. This reduces the installation time, saves tool changes and costs for drills. EJOT self-drilling screws are available in stainless steel for weather-exposed areas and in zinc-plated steel for unweathered areas. The EJOT SAPHIR self-drilling screws feature a classic drill point. They drill, form the thread and fasten components in one work step. The self-drilling screws are completed by an optional pre-assembled sealing washer. The EJOT self-drilling screws JT3 made of A2 stainless steel with hardened drill point made of zinc-plated steel are the economic solution for the fastening in unweathered areas. They are suitable for steel or aluminium components and are offered with a maximum drilling capacity of 18 mm. For special requirements, we offer the SUPER-SAPHIR JT6 made of A4 stainless steel with hardened drill point. The EJOT self-drilling screws JT2 made of case-hardened zinc-plated steel are the economic solution for the fastening in unweathered areas. They are suitable for steel components and are offered with a maximum drilling capacity of 18 mm. The EJOT self-drilling screws JT4/JT9 made of A2/A4 stainless steel are particularly suitable for fastening and fixing elements for rear-ventilated facade systems. They are the ideal solution to form floating and fixed points on substructures of rear-ventilated facades. With a drilling capacity of up to 6 mm, they are above all suitable for aluminium components. EJOFAST® screws - Fast. Without swarf. Reliable. EJOFAST® screws are self-drilling screws without the conventional cutting bit. Due to the innovative point geometry and the special thread form, the EJOFAST® screw not only fastens without any swarf and at high speed, it also features excellent clamping properties. The EJOFAST self-drilling screws are particularly suitable for the fastening of thin sheets. They are available in case-hardened zinc-plated steel and in A2 stainless steel with hardened drill point. 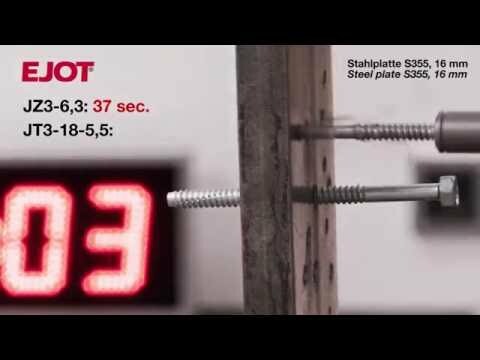 The new EJOFAST self-drilling screw JF3-6.8 is particularly suitable for the fastening of sandwich panels and trapezoidal profiles to timber substructures without any swarfs. The self-tapping wood screw drills through the sandwich panel or the trapezoidal profile virtually without any swarfs - thanks to its innovative combination thread which combines the positive characteristics of two different thread geometries. The point has the renowned EJOFAST thread geometry. This geometry grinds the wood fiber and replaces the pre-drilling. The thread merges into a wood screw thread with a diameter of 6.8 mm. Its high pitch diameter offers excellent pull-out values in wood.